Beijing's commercial property and office building sales surged 320.5 percent in the first 10 days of March, as more investors shifted their focus in response to the government's new measures to cool down the residential sector. Real estate brokerage company Century 21st said on Thursday that 759 units of commercial properties were sold and registered online from March 1 to 10, accounting for 6.3 percent of all transactions recorded during the period. The surge in commercial-property transactions followed the latest moves by the State Council to control the property market. It said on March 1 that homeowners who sell their homes will be levied an income tax of 20 percent on the profit they make on a transaction. Before the new rules, the income tax was 1 to 2 percent of the sale price. "It is obvious that investment-oriented purchases of residential housing will be further restrained, and the government intends to weaken the investment characteristics of home buying," said Kou Hailong, general manager of Century 21st Beijing. "So it is natural that more investors are turning their eyes to commercial properties when other investment channels are limited," he added. The commercial sector of Jin Mao Palace, a project close to Beijing's CBD area, is scheduled to put up 154 units for sale around the end of March at an average price of 49,800 yuan ($8,008) per square meters. However, there are so many potential buyers that the registration for purchases was closed within one day. "Even for those who have registered their names to buy the units, they have to draw lots to decide who can get the unit they want," a manager at the sales department said. Commercial projects due to be launched on the market in the following months are expected to raise their prices. In fact, following the government's stricter controls on residential property in 2010 and 2011, many Chinese investors have been exploring commercial property to continue to benefit from rising land values. 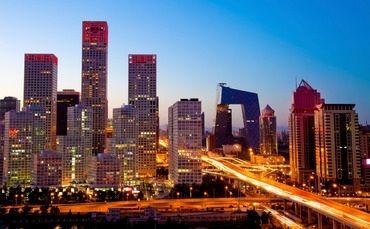 In Beijing, the market where restrictions on residential real estate purchases were most closely regulated, commercial real estate grew 23 percent in value in 2012, according to a report by real estate advisory company Knight Frank. Knight Frank expects these cities, especially Beijing, to continue to improve in value in the near future. Knight Frank's research also shows high potential for growth in lower-tier cities as many developments are launched in these markets. In the wake of infrastructure and economic pushes undertaken by local governments, many lower-tier cities are developing potentially lucrative commercial property projects. More mixed-use developments are also expected to come onto the market in the near term. "Beijing's growth in this sector has been phenomenal, and we expect this to persist as long as restrictions on residential real estate continue," said Nick Cao, Knight Frank China manager, head of investments and capital markets. "As for lower-tier cities, retail is a good option to consider as demand from local consumers is quite strong while some cities will focus on manufacturing and the industrial sector, which will pushes down the value of office and hotel space."